NOW CLOSED! 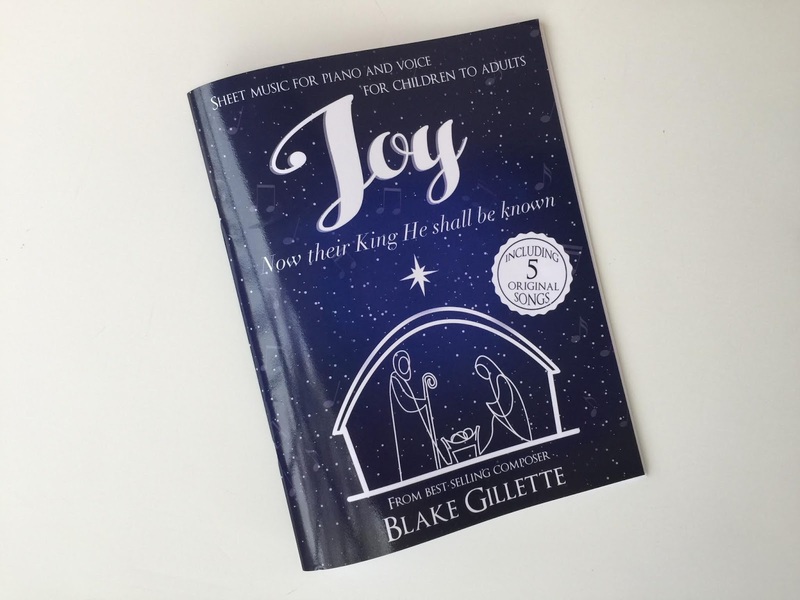 - JOY Now their King He shall be known by Blake Gillette GIVEAWAY!! This giveaway has closed, thank you for entering! Winners will be announced soon! If you have heard and LOVE the song I Will Be What I Believe by Blake Gillette, then you will LOVE this!! Blake's new Christmas music book, Joy Now their King He shall be known is now available! It's got some fantastic arrangements of songs we know and love, along with some brand new ones. The first song, Joy is a mashup of the Children's Songbook version of Away in a Manger and the hymn, Jesus Once of Humble Birth. It's beautiful - perfect for a children's choir and an adult choir singing each of the parts. If you are interested, the music from Joy is also found in a children's Christmas picture book entitled, Searching for Christmas by Holly Ann Gardner. As you read the pages, you are prompted to stop and listen to the songs (they are on CD in the back of the book). This could make for a very fun Christmas singing time as the storyline is Christ-centered. EXPIRED: I have a songbook and a picture book to giveaway, all courtesy of Blake!! One winner will receive the songbook and the other will receive the picture book! If you would like to enter this giveaway, just comment below with your name, email address and your favorite Christmas song (just for fun!). The contest will run until Wednesday, November 7th when the winner will be announced! They are also for sale at select Costcos in Arizona, Utah and Idaho if they haven't already sold out. 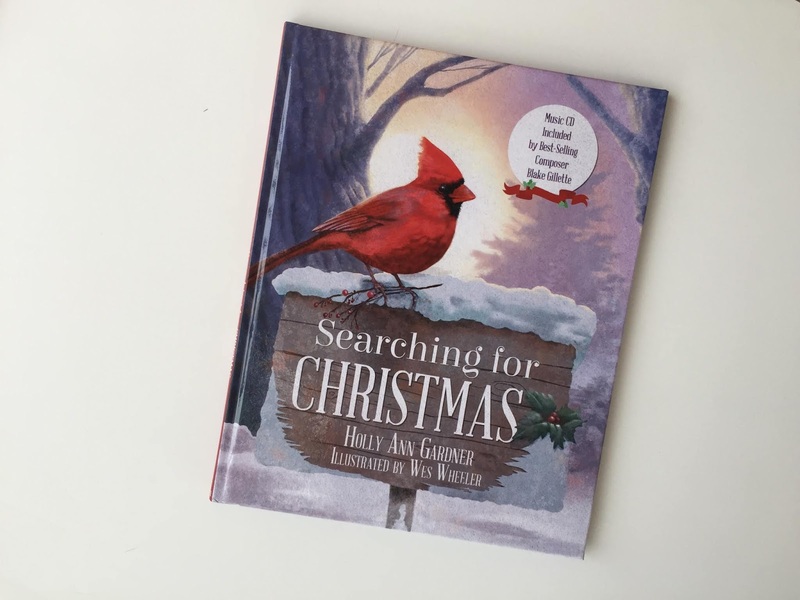 You can also purchase Searching for Christmas by Holly Ann Gardner on Amazon HERE. My name is Farrah, farrichards@gmail.com My favorite Christmas song is Silent Night. Christmas bells is my favorite. It’s easy to teach and learn and can have SO many fun variations! "O Come O Come Emmanuel" is one of my favorite Christmas songs. That song was beautiful! I just love his music. My favorite song is Had I Been In Bethlehem! My name is Nicole :) Zimm.nlove@gmail.com. My favorite Christmas song is O Holy Night. Helps me feel the Holy Ghost and the spirit of Christmas every time. I'm Michelle and my email is boyd.michelle@gmail.com . My favorite Christmas song is O Holy Night. But let's face it, I love them all! My name is Jessica Morton my email address is morton_jessie12@yahoo.com and one of my favorite Christmas songs are when Joseph went to Bethlehem! My name is Kristen Hill. My email is kristenhill25@gmail.com and my favorite christmas son is O Holy Night. Heather, heather.rae.isaacson@gmail.com, and O Holy Night if I had to pick just one! My name is Mary Rogers. My email is mmrogers1005@gmail.com my favorite Christmas song is The First Noel. Favorite Christmas song is Oh Holy Night. I'm Kim Holmes (mrsdrholmes@gmail.com). ONE favorite Christmas song? That's so hard...but I'll say Breath of Heaven. My name is Andrea Simmon, andreadsimmons@gmail.com, and one of my favorite Christmas songs is O Come, O Come Emmanual. I love The Shepherd's Carol and I love your music!!! Lisa Gutierrez (plum_marie2001@yahoo.com) Do You Hear What I Hear? Fav. Christmas song is definitely O Come, O Come, Emmanuel. And favorite Christmas song Come Rest Ye Merry Gentlemen! My favorite Christmas song is “Breath of Heaven” by Amy Grant! My name is Jacqueline Rees. Favorite Christmas song is O Holy Night! My favorite Christmas song- for the sake of listing one, I’ll say Joy to the World! My favorite song is Joy to the World. I have lots of favorite Christmas Songs. Hard to really choose one. I pick Picture a Christmas. Emily emilysapp1@gmail.com and my favorite Christmas song is “hark the herald angels sing” or “That’s Christmas to me” on the penatonix Christmas album! Dorothy dwalla11@yahoo.com my favorite favorite favorite is "Mary did you know?" By Clay Aiken. My favorite Christmas song is "Silent Night" with "Mary, Did You Know" as a very close second! I love O Holy Night and Angles we have heard on high, love the Gloria part! I love so many Christmas songs it's hard to pick one. I would say O Holy Night is definitely one that moves me and makes my testimony of his birth and life grow. I love most Christmas songs! I wish we heard more of the upbeat ones in our church like “Fum, Fum, Fum” and “Good Christian Men Rejoice,” though! Sarah Maya, studmuffinboys@hotmail.com, my favs are Silver bells and what child is this. Picking a favorite Christmas song is like picking a favorite child! One of my favorites is "I Just Knew," by Cherie Call. My name is Lisa Ahlers. My favorite song is away in a manger and o holy night is another favorite! Hands down my very favorite is God Rest Ye Merry Gentlmen. I so love your posts and emails each week. PLEASE enter me in the drawing for the giveaway. I tried to buy Joy at the Pocatello Costco and they didn't have it. I would love to know where it is available. My favorite Christmas song is "If I Were a Shepherd" and my Primary children in Island Park, ID love it too. Favorite Christmas song is O Holy Night. My two favorites are "What Shall We Give to the Babe in the Manger?" and "Angels From the Realms of Glory" with David Archuleta and Peter Hollens. What a great giveaway!!! I LOVE Christmas music, I am not sure if I can pick a favorite. I love to hear the children sing the primary songs. A pop one would probably have to be Mary did you know? My favorite songs are..The Nativity and Could I Hold The Baby! To hear the children sing is awesome. Silent Night, there's a Celtic version we sing in choir that's my favorite! I love Christmas music!! I don't have a favorite Christmas song because I love so many but "Mary Did You Know?" is up high on the list! Far Far Away on Judea's Planes is by far my favorite that is not sung enough! Lora Jones lorascheap@gmail.com - I love the song "I Heard the Bells on Christmas Day"!! One of my favourite Christmas songs is “I cry the day that I take the tree down” because I wish the season would really last all year round! I love Christmas!! I'm old school, and my favorite Christmas song is Silent Night. Hi! The songbook looks wonderful. I'm Jen (jensstuffatgmaildotcom) and one of my favorites is "I Bells on Christmas Day." I love them all!! "Lullaby," "Pictures a Christmas" and "Shepherd's Carol" are a few of my favorites from the children's songbook. I love All Christmas songs but my favorites are: Oh Holy Night, If I were a Shepherd, Away in Manger, and Silent Night. I also love Blake Gillette’s new song. I would love this book! I am hoping to use a few of the songs in my Primary this December. I love "O Holy Night" and "Silent Night"
I love all Christmas songs, but Angels We Have Heard On High is a favorite. Emily Freeman (not the author��) emmertee@gmail.com. I think my favorite is Some Children See Him. My favorite Christmas song would have to be O Holy Night. O Holy Night is my favorite Christmas song. I'm excited for this book! My favorite christmas songs are Picture a Christmas and O Holy Night. I love my calling and this time of year is my favorite. One of my favorite Christmas song is "Little One by Rebecca Woodworth. Thanks Camille for sharing.